Update: May-25-2015 Since SSC / DoPT makes daily changes in the notification about age/attempt limits and xyz technicalities. Kindly refer to their official site. Mrunal.org can’t claim following information is latest / correct. Warning: READ The NOTIFICATION thoroughly before applying. Otherwise you’ll face many problems during tier-2 and interview stage e.g. you’re not eligible for xyz post because of education /medical and so on. Education: Candidate must have completed their education on or before 1st August 2015. Age: to be counted on 1st August of the given year. (refer to table given on page1, for minimum age limit for each post and rule 5(A) on page 5. Certificates obtained in any other format will not be accepted. OBC certificate in the prescribed format issued between 02.06.2012 and upto 29.11.2015, only will be accepted. Revised options for posts will not be taken at the time of document verification. The options exercised in the application form are final. (page – 19 of official notification) The candidate is required to indicate his Posts-wise preference very carefully. He/She would not be considered for any post, if he/she has not indicated his preference for such posts. Option once exercised in the application is final and therefore, candidates are advised to be careful in exercise of option for posts. Ties cases will be resolved by applying one after another, as applicable till the Tie is resolved. Total marks in the written examination and Interview, wherever, applicable. (iv)Date of Birth, with older candidate placed higher. Ref: Page- 23 of official notification. Help line no of regional offices- Page- 26 of official notification. Ref: Page 26 of official notification. Sir I have Done Part-1 Registration But i have forget to take print out so how i can receive my Application ID No. Sir meine SSC cgl 2015 ka online form 12-05-2015 ko fill kia tha lekin mujhe koi conformation ka email nahi aaya to meine phir se form fill Kr dia …..mera form rejecte to nahi hoga??? Please clear confusion about the age..whether they are counting from august 1 or January 1. please clear as last date of filling form is after 2 days. I entered my percentage wrong last time in CGL 2014? I am applying for CGL 2015 if i enter correct percentage this time if they come to notice about my mistake i did last year? I wasn’t qualified last year. IN MRUNAL.ORG IT IS WRITTEN 28 MAY. The last date for applying the examination is extended to 09-06-15, previously it was 28th May. Same problem with me..if you guys find a solution to this,do tell me. What if some one already applied? is there any way to apply for others post after clearing exam? Same problem with me..any solutions?? My Age is 27 Yrs and 22 days as on 1.08.2015 & i have already filled CGL 2015 form for limited options, Now age relaxation have been provided so i am eligible for other posts too.How to correct the already filled form?? Did u applied again for others post? i have the same problem…. Sir, I just gave the 8th sem exams…. my result will be out in june. But I have submitted the CGLE 2015 form with qualification btech ECE with 60%. 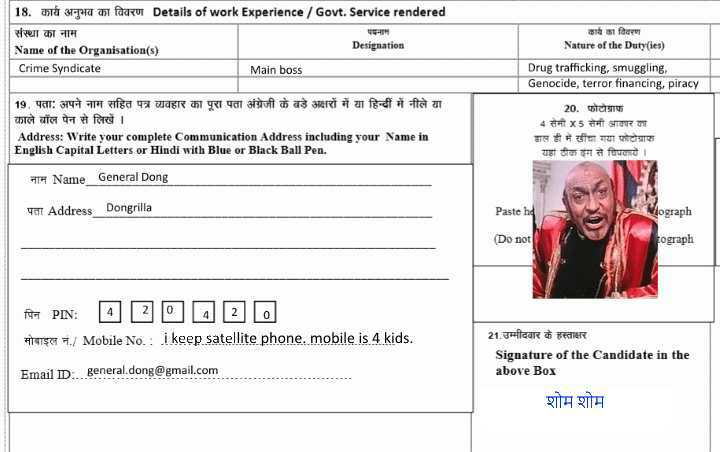 Did I fill the form correctly. Is there going to be any problem. i have mistakely fill category as general instead of obc….is dere ny way to correct it??? Completed both parts of the Registration, paid the fee online but didn’t get any confirmation mail. Moreover when i try to login to take a print out, it says the details are incorrect though i enter the correct Registration ID and Date of Birth. Does anybody have any idea what could possibly be wrong? Is it a server side problem or something else? i am from NWR region and i even tried to contact the regional office but the helpline numbers dont work. I have the same problem. Gave compiler as a preference , though Gabe no in the below column. What to do ? Is SSC desk job better than Telecom job at MNC @25k monthly? What would be their pros and cons to differentiate? Sir l have economics BA-1 BA-2 & final year i leave it. Can i reply for the post of ssc cgl compieler. sir, i am preparing for CGL exam from past many years but still not able to qualify it. every time i misses tier 1 or tier 2 by some marks. i am going to apply last time. can you tell me SSC CGL Exam date 2018. Also is the exam going to be CBT based or offline this time. sir, i am preparing for this exam for quite a few years now. Missed Qualifying the exam of tier 1 or tier 2 on some occasions. Now the vacancies are out again and i am going to apply. can you tell me what is SSC CGL Exam date 2018. Also if there is any changes in the pattern of the examination from last time.